Unlike some holiday destinations Lanzarote offers visitors a host of things to do. Encompassing a wide variety of sporting activities, through to more sedate pastimes such as shopping, visiting spas and hunting for souvenirs in one of the island's weekly markets. So if you have booked one of our Lanzarote villas or apartments here's an idea of what Lanzarote holds in store for you. Lanzarote has become something of a Mecca for sportspeople - especially during the winter months. As it offers warm weather training facilities just a four hour flight from the UK. The main hub of this activity is the La Santa sport complex, which is located in the north of the island and which serves as a base for both teams and individuals from across Europe. For example stars as diverse as Jenson Button through to the British Olympics team have all been put through their paces at La Santa in recent years. The team at La Santa are also the prime movers behind the annual Iron Man contest which takes place on Lanzarote every May and which is widely regarded as one of the most gruelling triathlons on the planet. In Costa Teguise you can head for Las Maretas, which boasts a 25m indoor swimming pool, small spa circuit and comprehensive gym facilities. The complex is open to tourists and costs from €6 for use of the pool for half an hour. In Puerto del Carmen you'll need to head for the Los Fariones Sports Centre, which is located close to the hotel of the same name in the centre of the resort. Los Fariones offers similar facilities to Las Maretas but is slightly more expensive. Whilst in Playa Blanca the best option is the pool at the Hesperia Playa Dorada Hotel, which is often very quiet outside of main peak hours (i.e. early morning and after 5pm) and which costs from €4 per adult. Lanzarote is regarded as the Hawaii of Europe, its underwater volcanic terrain creating great breaks which when allied with the prevailing winds here conspire to create the ideal conditions for surfing. Most of the action is concentrated on the North West coastline at Famara and there are a number of local schools who can have you up and riding the waves in a couple of lessons. These same sub aquatic conditions are also just ideal for diving - creating many points of interest for sub mariners to explore. Again there are dive schools located in all of the main resorts and some will even come and give private lessons in the swimming pool of your villa, before letting you lose in the Atlantic. Lanzarote is home to two excellent sports marinas at Puerto Calero (around five minutes from Puerto del Carmen) and at the Rubicon Marina in Playa Blanca. 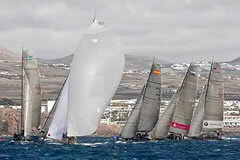 Plans are also afoot to create two further marinas in Costa Teguise and the capital Arrecife. These facilities provide plenty of options for anyone who is interested in learning to sail and there are also a number of companies who offer sailing holidays here on Lanzarote. Lanzarote's landscapes provide a great backdrop for cycling and are best enjoyed at a slower pace. The volcanic, mountainous terrain though can also prove quite testing, whilst many main roads have no cycle lanes, so it's only usually serious cyclists who venture outside of the main resorts. That being said there are hire shops in Playa Blanca, Puerto del Carmen and Costa Teguise where both road and mountain bikes are available for hire. 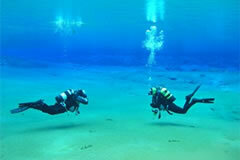 If your idea of fun is something a little less arduous then Lanzarote can also cater to your tastes and interests too. There are two main shopping centres on the island. The Biosfera is located in Puerto del Carmen and plays host primarily to fashion outlets such as Zara, Guess, Foot Locker and Mango, along with a number of local brand outlets too. Alternatively head for the Deiland Centre in Playa Honda which is geared more to locals and which houses a bowling alley, cinema (Spanish langauge films only), Burger King and variety of fashion outlets. Calle Real in the capital of Arrecife is the premier retail street on the island and come Saturday morning is buzzing with crowds out shopping and heading for the market in nearby San Gines. If a spot of pampering is more your kind of thing fear not, as there are a number of great spas on the island for visitors to enjoy. Amongst the best is the thallasotherapy spa located at the Hesperia Hotel in Puerto Calero, which is open to non residents and which boasts a great hydrotherapy circuit as well as a wide range of different treatments.